I know I told you that June had another theme, that fly one, but let's forget that. 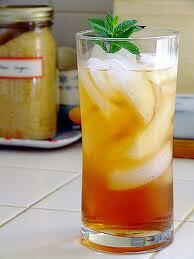 June is National Ice Tea Month! Let's celebrate with a recipe for Sweet Iced Tea and a song about that very thing from fabulous comedian Anita Renfroe. To make 1 gallon of sweet iced tea, boil 2 quarts water. Turn off burner and pour in 1-2 cups sugar. Stir until the water turns clear. Throw in 4 family-size (quart-size) tea bags and steep for 5 minutes. Remove tea bags and let hot tea cool. Pour in gallon-size glass pitcher or plastic jug. Make sure your containers can withstand hot liquids. Fill the rest of the gallon container with cold water. Add ice if you want. Refrigerate and serve cold! While you're making it, you might as well listen to this Anita Renfroe song about Big 'Ole Sweet Iced Tea! When I was younger, I dreamed about me older and the main thing I saw myself as was a tea drinker. Unfortunately, I can't seem to like any tea but that Citrus Green tea. :( Maybe I'll have to give this one a try. Thanks!